Take a pan and heat oil. Add urad dal and sauté it till it turns dark brown, add onions and sauté it for about 2 minutes. Add spinach, red capsicum, salt, chaat masala and cook for about 2 more minutes. Add this mix to idli batter. Add salt, soda bi carb to the batter. 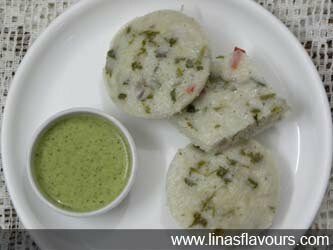 Grease idli stand with oil and steam cook the idlis in batches for 10-12 minutes.